Once upon a time every nation had high hopes regarding the future of the neural boosters. Many believed they were the next natural step for humankind in improving itself. Each of the empires started their own booster research, dreaming of creating a wonder brew that would propel their subjects to greatness. These dreams came crashing down one day when it was discovered that neural boosters had some very unfortunate side-effects that turned them in a heartbeat into public health hazards. One of the less well-known booster research firms was that owned and run by Igil Sarpati, a competent Gallente scientist. Sarpati’s firm, simply named Sarpatis, was contracted by the Gallente Federation to lead booster research. When the Federation banned boosters following the discovery of the fatal side-effects the rug was pulled from beneath the company’s feet and it quickly went under, sharing the fate of almost all other companies that built their operation on boosters. A few years after the company closure Igil Sarpati died. The Sarpati family passed into obscurity, seemingly destined to go down in history, alongside thousands of others, as failures. Igil's adopted child, a Caldari named Virge Salvador Sarpati, became the head of the family after his father's death. He grew up in the shadow of his father's failure and this experience marked him for life. In time he founded his own company and called it Serpentis, an older form of the family name and a tribute to his late fathers' company. The only assets of Sarpati junior were the old booster formulas of his father, but as boosters were banned the formulas were worthless. So instead of going into the pharmaceutical business like his father V. Salvador Sarpati (as he likes to be called) instead focused on hi-tech R&D. Slowly, but surely, the company gained strength. Although it began nominally as a Gallente-based company it had from early on a very cosmopolitan character, considering itself unattached to any government. Due to his past experience Salvador became increasingly antagonistic to the Gallente, to the point where he only allowed Caldari corporations and Caldari officials access to the higher echelons of his organization. Three decades ago Sarpati bought a system in the Phoenix constellation and named it Serpentis. He built himself a magnificent space station orbiting Serpentis Prime and runs his company from there. As his power and wealth grew he has expanded the territory he owns and now runs a dozen space installations around the world of EVE. Although all the Serpentis stations are officially termed research stations they have in time grown into notorious pirate havens. Sarpati himself encouraged such development, hinting at a more sinister long-term strategy than offered by his innocent-looking company. Indeed, it has been rumored that once Sarpati had set himself up he dusted off his father’s old formulas and turned his research facilities on them. Opening one’s stations to pirates and outlaws can easily become a double-edged sword, but Sarpati was smart enough to get himself a protection. He made a deal with the Angel cartel that it would provide protection for all Serpentis stations. In return the Angels would get a cut of all trade on these stations and access to any research breakthroughs the Serpentis corporation makes. This deal has been so lucrative for both parties that the Angels have devoted their entire Guardian Angels division to protecting Serpentis space and the Sarpati family lives in unprecedented luxury. The DED is not wholly unaware of the situation and has made numerous attempts to close some of Sarpati’s establishments, but to no avail. 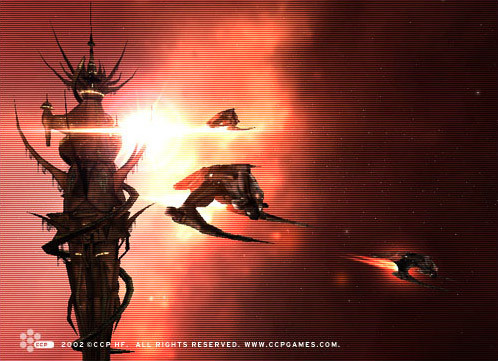 V. Salvador Sarpati has gathered a small retinue to dwell at his side in the Serpentis system. There they spend their days in idle games and frolics without a worry in the world. Sarpati himself is an active participant, although his boundless energy and ambition allows him to break out of it every once in a while to take care of his small empire. The more frivolous of Sarpati's retinue live with him, while the more headstrong are scattered around the other Serpentis stations running things. Only one member of Sarpati's adopted family, his sister Santimona, has rejected both the indolent life at Serpentis Prime as well as Sarpati's close links to the underworld. She is now a member of the Sisters of EVE order and mocks her brother and his lifestyle at every opportunity, calling him King Serpent and Serpentis Prime his royal court.